POLL: Best Feature On ‘Follow Me Home’? Arguably one of the biggest albums to ever come out of Strange Music, Follow Me Home has been making waves since before it was even released. The lead single, “All My Life”, featured one of the biggest guest spots on the album in Lil Wayne. Thanks to Jay Rock’s reputation in the industry, the guest spots didn’t end there. 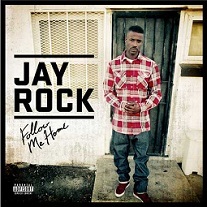 Follow Me Home enjoyed company from the likes of Chris Brown, Rick Ross, will.i.am, Black Hippy, Krizz Kaliko, and Tech N9ne. From “Finest Hour” to “Kill Or Be Killed”, the collaborations made for some classic verses from every MC. We would like to know which guest feature from Follow Me Home you think was best. Vote below for the best guest feature from Follow Me Home. Best Guest Feature On ‘Follow Me Home’? Click here to purchase Follow Me Home on iTunes.